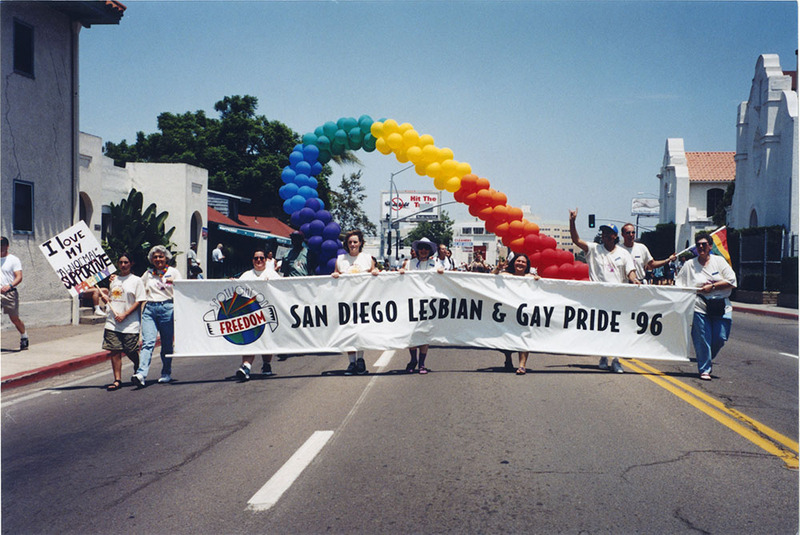 “San Diego Lesbian & Gay Pride ’96” banner opens the parade. Lambda Archives of San Diego. 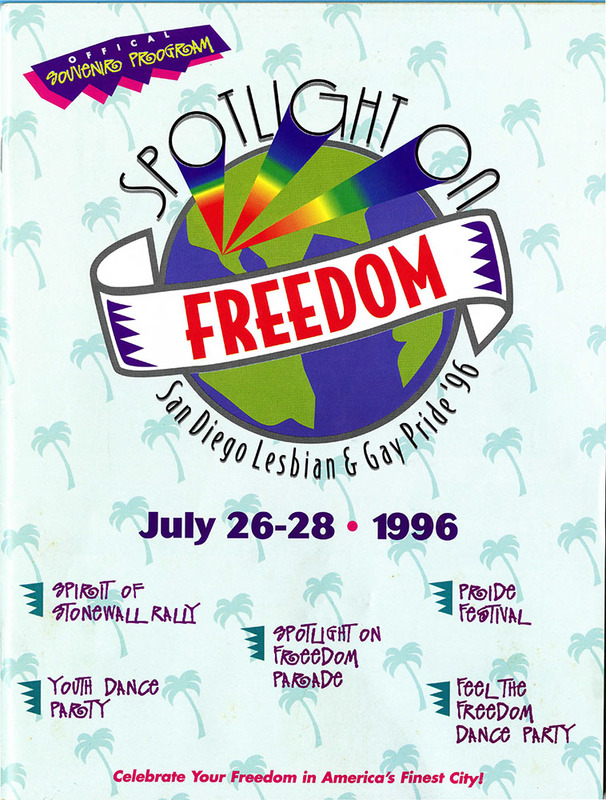 In 1996, San Diego Pride focused on politics, as a presidential election was to take place in November. At a national level, the LGBTQ+ community was celebrating the Supreme Court’s decision to strike down Colorado Amendment 2, which rescinded state and local laws prohibiting discrimination on the basis of sexual orientation and prevented the future enactment of any such laws. However, the Republican National Convention was scheduled to take place in San Diego from August 12-15 and the Republican party at large held an anti-gay position. In response, San Diego Pride launched a “Rainbow Flag Campaign” to encourage widespread display of rainbow flags demonstrating San Diego’s strong gay presence to RNC attendees. Additionally, Pride weekend was pushed back to the end of the month (July 26-28) to lead into the convention. Voters Organized in Coalition for the Elections (VOICES) march in the parade, 1996. San Diego Pride Photo Collection 1994-2008, Lambda Archives of San Diego. 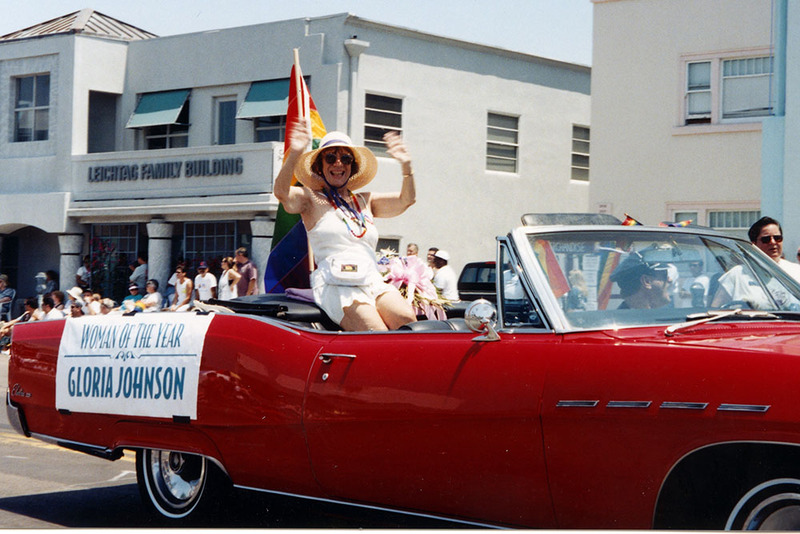 Woman of the Year Gloria Johnson rides in the parade, 1996. San Diego Pride Photo Collection 1994-2008, Lambda Archives of San Diego. LGBT Voices (Voters Organized In Coalition for the Elections) launched a voter registration drive in June and organized demonstrations to disrupt the convention. Thousands protested the convention over the week, and Pride parade attendance increased from 60,000 to 80,000. Many of Pride’s honorees were celebrated for their political involvement. Urvashi Vaid, former executive director of the National Gay and Lesbian Task Force, was selected as one of the Grand Marshals and the rally keynote speaker. Longtime lesbian activist Gloria Johnson was awarded as Woman of the Year for her work in the San Diego Democratic Club and involvement with LGBT Voices. Herb King, who served as vice chair of the San Diego County Democratic Central Committee and a delegate to the Democratic National Convention, received a community service award. 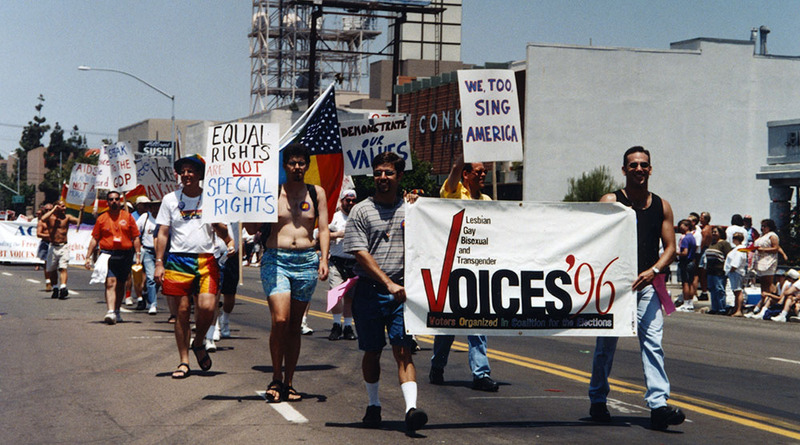 The San Diego Democratic Club received the 1996 Stonewall Community Award. 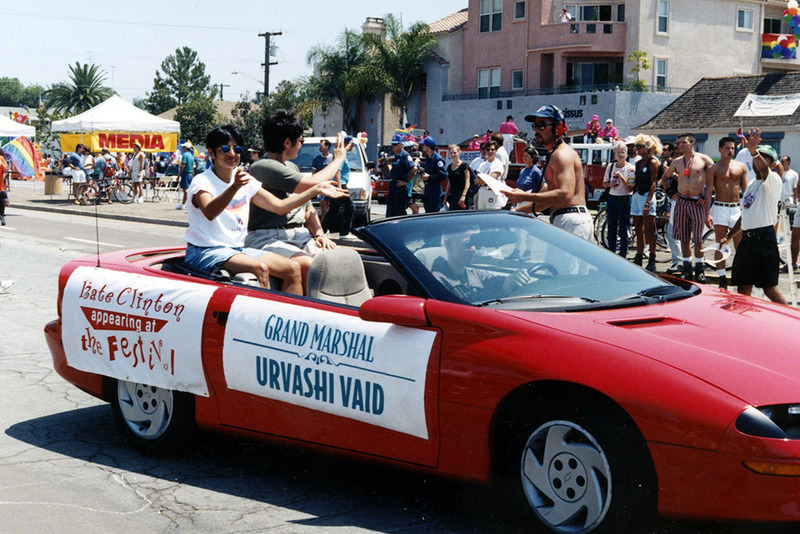 Grand Marshal Urvashi Vaid rides in the parade, 1996. 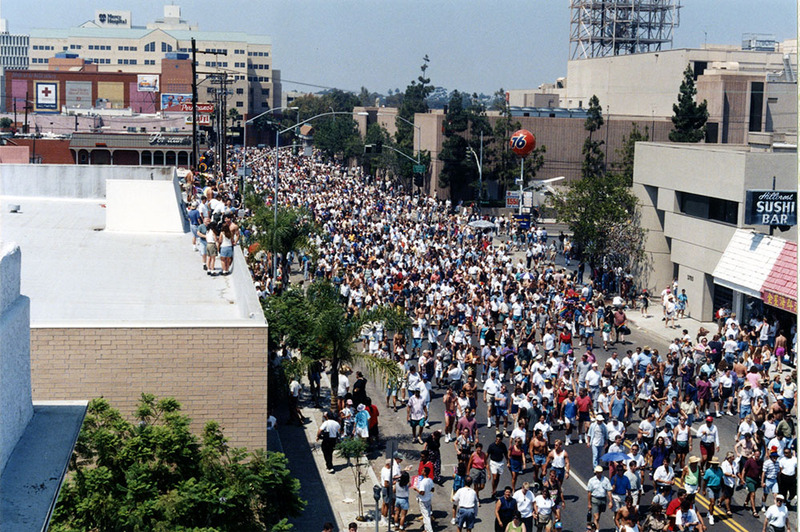 San Diego Pride Photo Collection 1994-2008, Lambda Archives of San Diego. 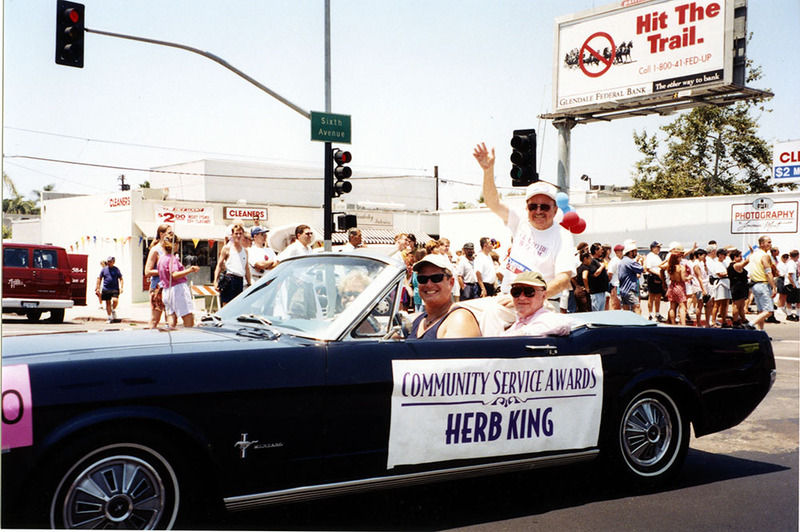 Community Service Award recipient Herb King rides in the parade, 1996. San Diego Pride Photo Collection 1994-2008, Lambda Archives of San Diego. Souvenir Program, 1996. Lambda Archives of San Diego. Additionally, the 1996 Pride Souvenir Guide featured a Clinton/Gore ad sponsored by the San Diego Democratic Club. Unfortunately, that September, President Clinton would sign the Defense of Marriage Act into law, mandating that a legal marriage was between one man and one woman, and therefore excluding the LGBTQ+ community. Bird’s eye view of the parade at 6th Ave, 1996. San Diego Pride Photo Collection 1994-2008, Lambda Archives of San Diego. A new aspect of Pride that year was the involvement of the Gay Pride Youth Committee, who worked to organize a series of events geared towards queer youth and heightening their visibility. The Youth Committee presented a “Proud of Our Future” award to Grand Marshal Wilson Cruz for his role in creating youth services at the Los Angeles Gay and Lesbian Center. 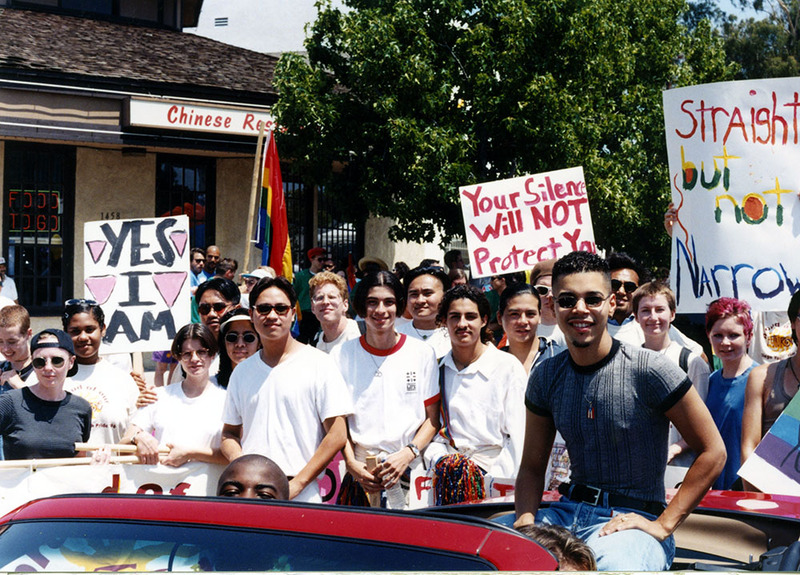 Grand Marshal Wilson Cruz with crowd in the parade, 1996. San Diego Pride Photo Collection 1994-2008, Lambda Archives of San Diego.